During the 1820's, a number of large Regency houses were constructed In Sidmouth, Devon. These well endowed family homes faced south towards the sea but were set well back from it. The fine building, now known as SIDHOLME, was amongst these. Originally called Richmond Lodge, it was built in 1826 and subsequently occupied by the 6th EARL of Buckinghamshire with his second wife and growing family. A splendid example of regency grandeur; it has a large music room which was attached, as an addition, in about 1848. English Heritage list SIDHOLME with its Music Room as 'Grade 2 Star'. Within the listing, details of the Music Room and its organ and chandeliers are noted as being fine examples of historical importance. The house is also listed in Simon Jenkins book 'England's Best 1000 Houses. Over many years, the organ and all 7 chandeliers have fallen into disrepair. In the early eighteen sixtie, seven Osler type glass chandeliers were installed. All are suspended from the lofty music room ceiling and originally were gas fuelled. They are now in urgent need of repair and can no longer light this magnificent room properly. To regain the original overhead lighting brilliance and regain the true ambience of this wonderful room is the current objective of the Friends of Sidholme Music Room. The 1st phase, now completed, was to restore the central and MAIN CHANDELIER. Wilkinson plc. 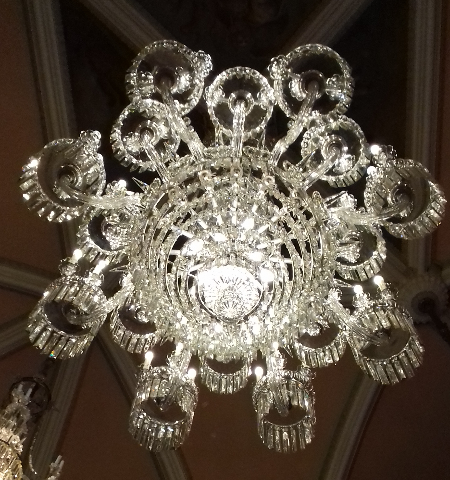 who hold the Royal Warrant for chandeliers carried out this work in their specialist Kent workshops. They have an excellent internet site and you can see more at http://wilkinson-plc.com/ . The MAIN CHANDELIER is pictured here as it now is after it's complete restoration.